Borough Road Gallery, LSBU's professional on-campus gallery, is celebrating its three-year anniversary on 23 June with screenings of a BBC film about renowned modernist artist David Bomberg. 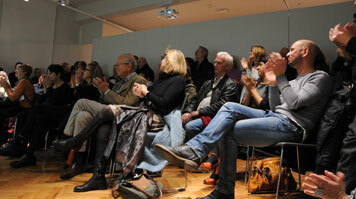 The Borough Road Gallery opened in June 2012 with funding from the Heritage Lottery Fund. It cares for A David Bomberg Legacy – The Sarah Rose Collection, a collection of over 150 works spanning a period of nearly 100 years, centred on the practice and influence of David Bomberg, considered to be one of the most significant British artists and teachers of the 20th Century, and who taught at LSBU in the 1940s and 1950s. To celebrate its three-year anniversary the gallery is holding three drop-in screenings of the BBC film, David Bomberg: Prophet in No Man's Land (2014). Presented by British Art Historian Andrew Graham-Dixon, the film examines the life and work of David Bomberg, from his beginnings as a Jewish immigrant growing up in London's East End, and his experience as a soldier in WW1, through to his years living in Palestine and Spain and his time as a teacher at LSBU. It first aired on BBC Four in autumn 2014 as part of the three-part series British Art at War: Bomberg, Sickert and Nash. Additionally the gallery will screen a new short film by an LSBU BA Digital Film and Video graduate and independent filmmaker, Michael Vassou Ourouho, which explores the Gallery's first Artist Residency, with contemporary painter Susan Sluglett. Ourouho's film includes new footage and interviews that give a further insight into how Sluglett responded to A David Bomberg Legacy – The Sarah Rose Collection throughout her residency, which culminates in the gallery's current exhibition, Hands Rhythm: Susan Sluglett (A Conversation with the Borough Group), which will be open especially during the film screenings. The screenings will be held on 23 June at 1.30-2.45pm, 3-4.15pm, and 5-6.15pm, in the Digital Gallery, London South Bank University, 103 Borough Road, SE1 0AA. Admission is free. Hands Rhythm: Susan Sluglett (A Conversation with the Borough Group) runs at the Borough Road Gallery until 4 July.